Environmental protection campaigns, especially garbage collection, have been launched across the country. The message about environmental protection is also spreading and growing day-by-day. The story about nearly 100 young people collecting garbage from a canal in District 2, Ho Chi Minh City, has attracted comments on social networks because the local People’s Committee is trying to shut down the operation. 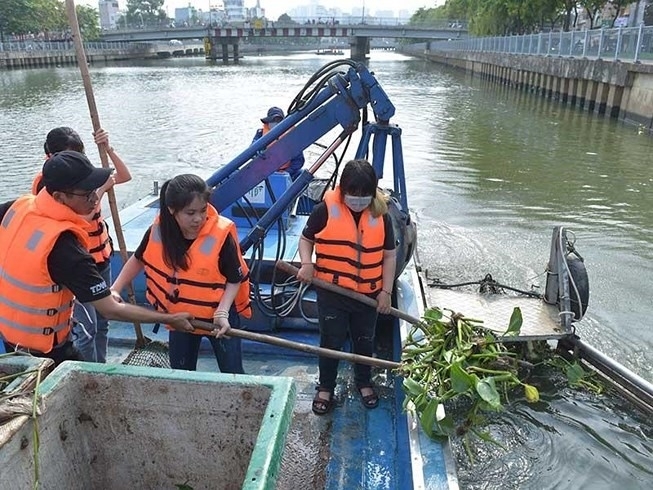 On March 17, Vu Ngoc Chien, a swimmer who had the idea of collecting trash using paddleboards, launched a garbage collection campaign along a number of canals in Thao Dien Ward with nearly other 100 young people, Thanh Nien (Young People) newspaper reported. “My group planned to use paddleboards to collect waste along the canals but we did not inform local authorities so we were forced to stop,” Chien told the newspaper. Chien’s group had previously asked for permission from the management board of the Nhieu Loc – Thi Nghe canal to collect trash, but they were told to consult with the local People’s Committee. They were then told to apply for permission from the Department of Transport. "I was so tired of submitting all the applications, so we started a group of 20 people collecting trash from the roof of Thu Thiem Tunnel,” Chien said. “We planned to work every month in order to make people pay more attention to environmental protection. We don’t know which agencies we should apply to for permission next time,” Chien said. Huynh Thanh Khiet, deputy chairman of the People’s Committee of District 2, explained that the district fully supported voluntary activities on environmental protection but the group should report their activities to local authorities in order to ensure security and order, and most importantly, safety. A leader of Thao Dien Ward’s People’s Committee also said he supported the idea. However, collecting garbage along canals was more dangerous than on the streets. In case of any incidents, the ward would be held responsible, he said. Many people have opposed the actions taken by the local government and argued that authorities should have taken measures to support the youngsters. “Tight administrative procedures are causing difficulties for this group who want to contribute their time to cleaning up the environment,” said Nguyen Viet Hung, a resident from Ha Noi’s Hoang Mai District. He said this was not the first case involving local authorities preventing people from voluntarily cleaning up the environment. In 2016, the leader of Yen Hoa Ward in Ha Noi’s Cau Giay District complained about a foreigner who had collected garbage in the ward without permission, causing public outcry, Hung said. Local governments should find solutions to prevent littering instead of obstructing voluntary garbage collectors, Hung said. But there are also many supporters of the government’s stance. Most of us appreciate the young people’s work to clean up the environment, which also acts as a reminder to people who are still throwing their trash into rivers and canals. But local authorities need to know when up to 100 people are going to be dredging canals for trash, even if they know how to paddle and swim. “The spirit of environmental protection is always supported by the community but safety needs to come first,” said Phan Quynh Lien, an officer from the Ho Chi Minh Communist Youth Union Central Committee in Ha Noi. “Collecting garbage along canals requires specialised equipment; collectors must also have basic skills both on the river and about garbage collection. Collecting waste on canals is not as simple as collecting trash on the shore and the waterways can be dangerous,” she added. In order to collect garbage from canals, ponds and lakes safely, people need to contact local authorities for advice and support, Lien said. “They should also contact local youth unions for support,” Lien said. Given the fact that Chien’s team was unable to get permission from local authorities, I think we need regulations in place for people who are simply trying to lend a hand. We can see enthusiasm for this goal in the community, especially among young people. We need to find a way to tap this effectively. Many provinces and cities have told people not to throw rubbish in the canals and streets. However, it is not easy to see much change. Garbage can still be seen floating on the water in many areas. Every day, millions of people still throw their garbage out with complete disregard. I hope that future clean-up projects can gain government approval for people who are simply trying to make out country a better place. Removing the garbage from our canals, rivers and lakes is not the answer. The answer is stopping people from throwing it in there in the first place.